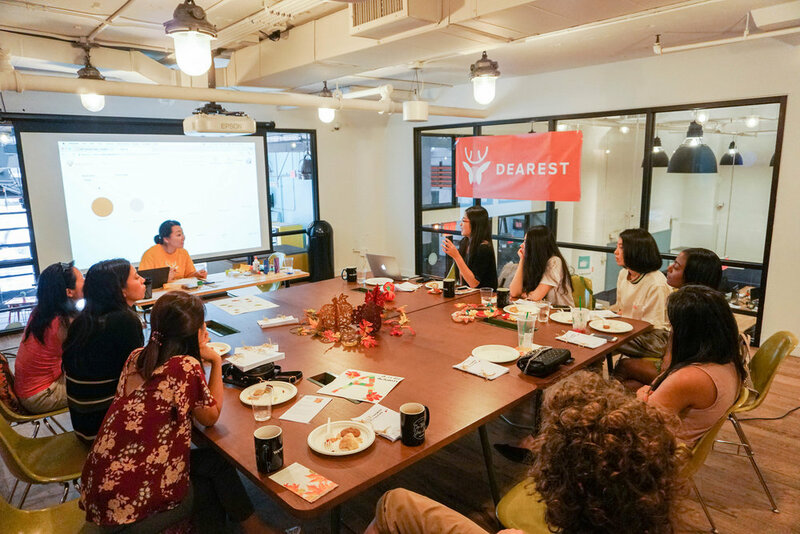 We kicked off the event with a warm welcome by Eiko, founder of Dearest, who was extremely delighted to see the many happy faces of providers at the company's first event. 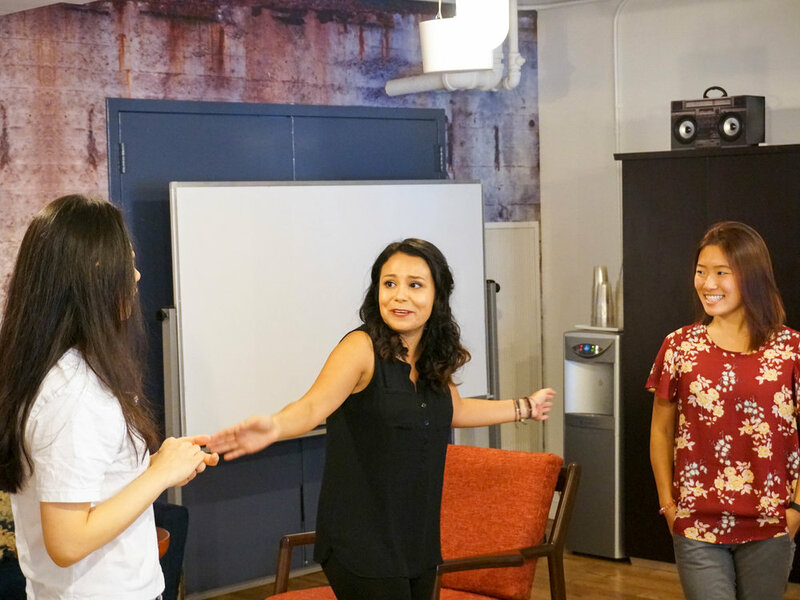 Maya, our Community Development Manager, then led the introduction on how to use the platform and our educational session guideline to give everyone a better idea and structure of what Dearest is all about! Adam, Guest Teacher, from NYU, who is also a provider on the platform, started off by taking us through some Teaching Practices and Strategies for STEM Educators. His Ph.D. Research at NYU is based on STEM and Literacy for young children. As an experienced teacher (both General and Special Education), his passion for teaching and learning Science definitely shone through as he took us through some hands-on science activities to do with children. The first station revolved around The Phenomena of Inquiry: Why Structures Stand or Fall? Providers got their hands busy by building structures with different materials in various ways. The next station explored the Concepts of Floating and Sinking. Adam explained how using different cultural tools and words can stimulate thinking in each child and best practices on teaching. The third station was focused on Exploring Light Phenomena as providers learnt how to use a pin-hole camera to teach concepts related to light and creating shadows. Up next was our STEM Competition! Providers came with a brainstormed STEM Activity with a chance to win a $50 Amazon Gift Card! It was amazing seeing how some providers came prepared not just with activities but props too! Congratulations to Rebecca for winning the prize! It was a really close call given the thoughtful educational activities suggested by other providers. This was also a great way for everyone to share ideas to grow and learn from each other. To wrap up the event, we handed out goodie bags - with activity inspiration and some handy materials to use during sessions. Before we listed those activities however, we made sure we could do it too. So we experimented, tried and failed and put those that succeeded on display! We hope everyone that attended walked away with great ideas and inspiration to teach and we just wanted to thank all of our providers and people who contributed to making this event a success. We can't wait to share with everyone more about future workshops that are currently in the pipeline. Don't forget to follow us on Instagram, and like us on Facebook to stay tuned for updates! Event: Global Readiness Workshop For Ages 3-8! Last Saturday, we traveled around the world for our Global Readiness Workshop! Children ages 3-8 joined us for a trip to learn about other countries’ customs and traditions on celebrating birthdays. Along with our Dearest educators, they visited China, South Africa, and Mexico for an immersive, multicultural experience! Event: Design Thinking Workshop For 3-5 year olds -Round 2! This time round we held a drop-off session to promote greater interaction among the children and boy was it exciting! Some came all decked out in their very own space clothes! We started off with a fizzy science experiment of exploding planets - a sensory activity for the children to learn about basic chemical reactions. They definitely enjoyed the process of getting their hands dirty. Not long after that, Dodo made his debut appearance! You can see from the faces of the children that everyone had different reactions to this strange orange puppet from outer space! Someone was quick to get up on his feet and point out "This is Jupiterrrrr!" He was soon corrected by another two who pointed out that that was in fact, the sun, and that Jupiter was the fifth planet from the sun. It was a learning process for everyone! We then moved on to play a mini space game called "Don't drop the asteroid"! In this outer space game, the little space explorers had to keep all the asteroids (balloons) up in the air while the music played. When the music stopped they all grabbed an asteroid and froze! After the game, we settled down and began with Design Thinking Step 1: Asking questions. The key was to ask Dodo questions to find out about his needs and the problem he was facing. 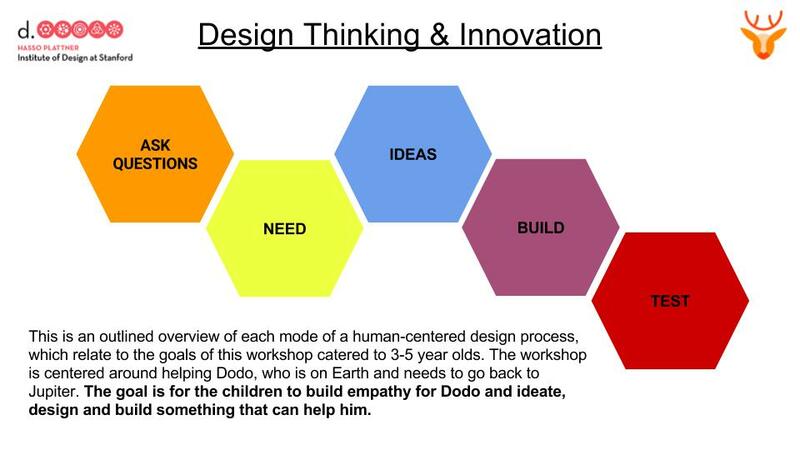 Upon defining the need (Design Thinking Step 2: Identifying the need) that Dodo needed to go back to his home on Jupiter, we set out on a process of coming up with ideas (Design Thinking Step 3: Ideation) on how to help. The children came up with fantastic ideas on building a rocket ship! Not without building some space helmets first! Soon after, we left our space helmets to dry and got started on the building process of our rocket ships (Design Thinking Step 4: Building)! There were plenty of materials for everyone to choose from and start building. Everyone got busy with custom designing their very own individual rocket ships. They used tapes, paper plates, buttons, and a whole bunch of other recycled materials to build. Dodo asked Jason, "What are you building? " as he saw the boy wrap some tape over some silver shapes. He responded, "I'm packing some food to bring to space so we can eat in the rocket ship!" How brilliant!! Once they were done decorating, most of them were pretty proud of what they had built. Some even liked chilling out in their little rocket ships. Up next was the trip to space! This was Design Thinking Step 5: Testing what they had built. Some were a little apprehensive while others were real excited to see what lay behind the dark curtain! They were fascinated by the flickering lights and atmosphere in the space room. Most importantly, they helped Dodo get home and back on Jupiter! Once we were out of the space room, we reviewed our activities and discussed how it felt to help Dodo get back to his home. We framed Design thinking as a tool you can use to help people anreven aliens! A group photo with their rocket ships! For the full photo gallery, see here. We want to extend a big, warm thank you to everyone for coming down and participating in this workshop with us. At Dearest, we believe that exposure to empathizing and problem-solving concepts are an important part of a child's learning and education. We can bring these educational activities to your home, through our Dearest Providers, given our focus on personalized learning. If you've enjoyed this event and/or are looking to attend future events, you can sign up for our service here. We hope to see you join us at bigger and better future events! How Can I Teach Math to My Little One? In the Dearest Math Curriculum, a new set of activities will be sent to you electronically every week that include easy-to-follow instructions, materials, and tips that focus on Early Numeracy. 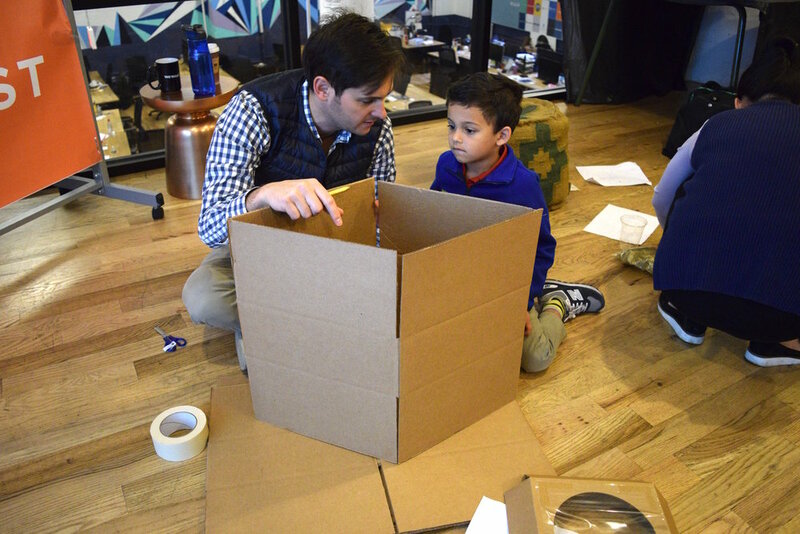 Event: Space-themed Design Thinking for Children 3-5! 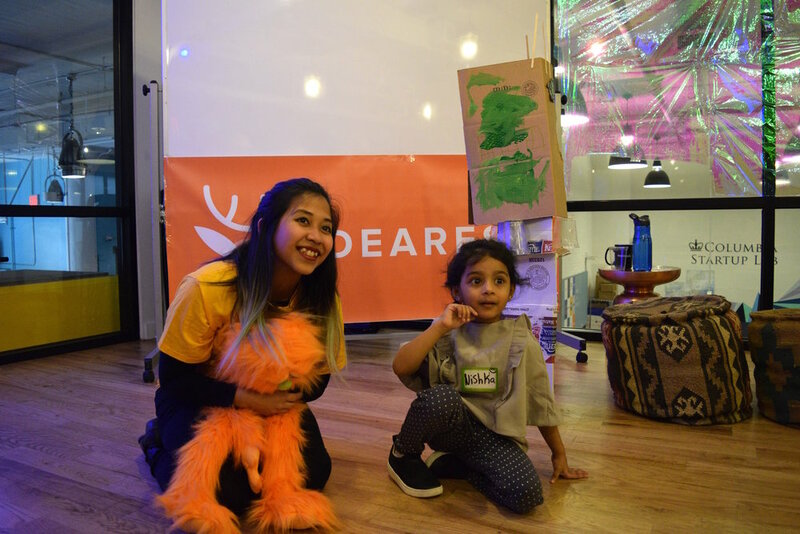 This Design Thinking Workshop for 3-5 year olds introduced problem-solving skills to the young children where they had to help an alien Dodo get back to his home on Jupiter. The event kicked off with a little alien song and a mini introduction to the Stanford d.school Design Thinking Method. Design Thinking Step 1: Asking questions. The children started off by asking questions to Dodo to find out his real needs, and with the help of prompts from some of our Dearest providers, we soon got the ball rolling! Design Thinking Step 2 & 3: Define needs and ideate. Once the need for Dodo to go back to Jupiter was defined, the children began the ideation process by writing down their ideas on a piece of paper. The children shared their ideas with Dodo, many of which included ideas on building a rocket, spaceship, and even a flying disc! Dodo loved hearing about the children's ideas and was super excited to be traveling back to space with them! Design Thinking Step 4: Build! This was the most exciting part where parents and children worked together to build out their ideas. 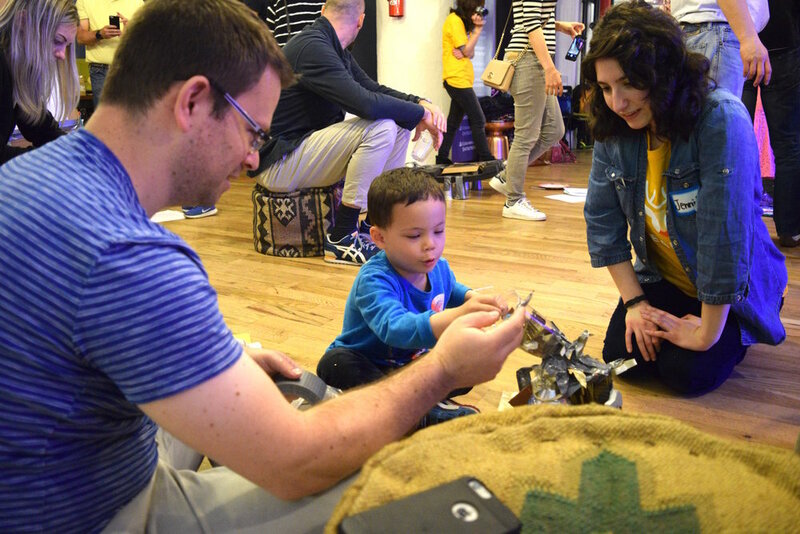 Everyone got their creative juices flowing and we soon had a room filled with super cool DIY rockets, space, ships and even space suits! Above, we have one of our Dearest Providers, Eva, helping Nishka and her dad build their spaceship for the trip to Jupiter. And below, we have Forrest, fully focused on painting his beautifully designed flying disc! Design Thinking Step 5: Test what you built! Once the children were happy with their finalized project, they got to test out their rockets, spaceships, and spacesuits on a trip to space! They were on a mission to help Dodo and bring him back to Jupiter. They eventually reached Jupiter and Dodo was happy to be safe and at home, all thanks to the help of the children. It was time for them to go back to Earth! They traveled back to Earth where our Dearest Provider, Jennifer, did a mini Space Storytime as a concluding activity. The children seemed happy with what they had built; Noah loved his suit so much that he kept it on throughout even after the trip to space! The workshop finally came to an end with a short wrap-up and review of the Design Thinking Method. This is a great method to deeply understand other people's problems and pains, while subsequently trying to build a solution that will help them. Exposure to these problem-solving concepts for your child will put them in good stead for building effective solutions for people. We want to extend a big, warm thank you to everyone for coming down and participating in this workshop with us. It was a fun experience and we hope you managed to bring home a small takeaway from this Design Thinking Workshop. At Dearest, we believe that exposure to thinking and problem-solving concepts are an important part of a child's learning and education. We can bring these educational activities to your home, through our Dearest Providers. If you've enjoyed this event and/or are looking to attend future events, you can sign up for our service here. We hope to see you join us at bigger and better future events! 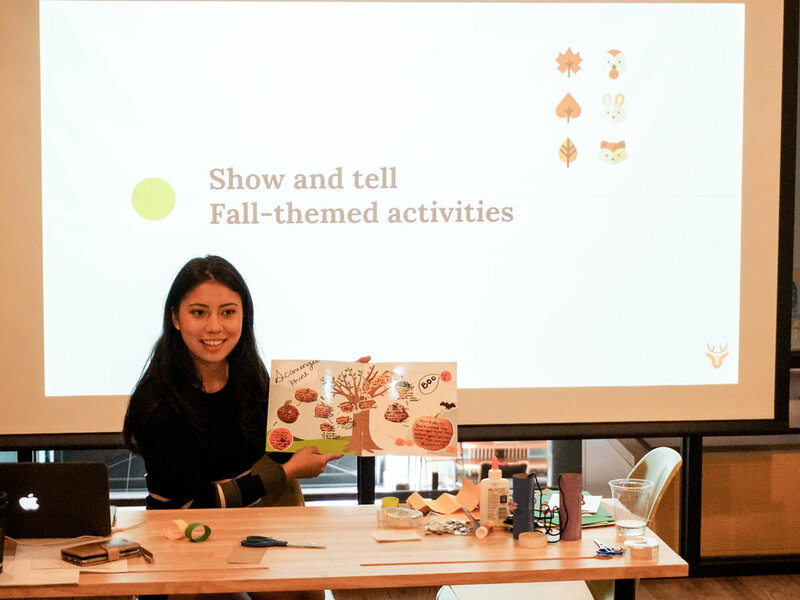 We invited parents of 1 to 5-year-olds for an intimate Lunch and Learn event to share more about Singapore Math, the Dearest Math curriculum, and how Dearest sessions can promote the student's development. Lunch and Learn Event Part 2! 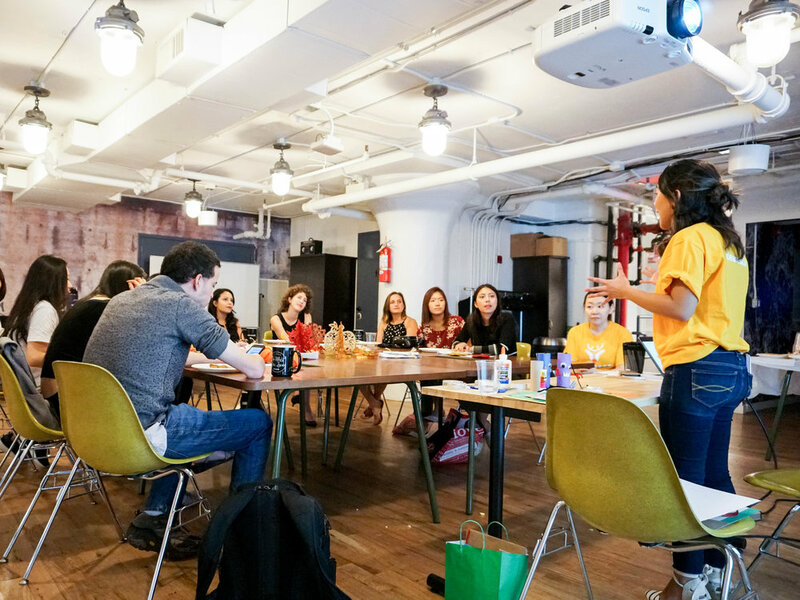 We hosted another Lunch and Learn for parents with 1 to 5-year-olds and this time, we brought it to Midtown East! It’s always a fantastic time for us to share more about Singapore Math, the Dearest Math curriculum, and how Dearest sessions can promote the student's development.